Like a pair of none-too intrepid zoologists, David and spent much of last week attempting to introduce our TWO newly purchased Blue Bears into the Snood's natural habitat. 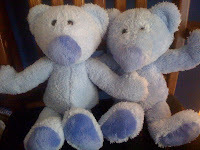 For those of you who might have fallen behind in our saga, as of our last visit to this topic, David and I had jumped through a series of SNAFU-laden hoops in order to procure two duplicate versions of Snoodie's beloved lovey, "Blue Bear". Our goal, as we chose to accept it, was to get Snoodie to fall for the 'replicate' bears, thus establishing their role as 'backup loveys' should some unforeseen tragedy befall Blue Bear the First. The original Blue Bear has been with Snoodie since birth, but he's only been heavily relied upon (and thus heavily chewed, barfed and generally gooped upon) for the past six months or so. He's showing signs of wear, but we estimated that he was not so worn-in that our new bears couldn't catch up, as long as we could move them into the rotation with all deliberate speed. We had concerns right off the bat - understanding, as we did, that this would be a delicate operation. There was no room for mistakes. Much like a set of organs being prepped for transplant, we know that any irregularities in our replicate bears could cause them to be rejected by the host. Our first step was to line up all three bears for inspection. 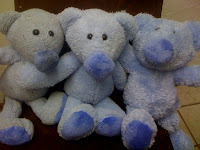 Right away we noticed that there was something seriously amiss with Blue Bear #3. While his tag read "Mr. Beeps 15-inch" (as did the tags of his two fellow bears), he clearly was not a match. His blue fur was at least twice as voluminous as that of Blue Bear #1. The dude was SUPER fuzzy. ...who we were thrilled to discover was a nearly identical match! I mean, sure, he was a wee bit cleaner that the original and his fur was a wee bit, well...furrier, but David and I felt sure he was close enough to fool the Snood. Snoodie's eyes lit up and he immediately leapt to his feet. The search was on! 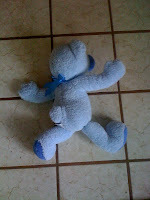 As he turned the corner into the living room, there was Blue Bear #2, lying face-down on the floor. Snoodie pointed towards him in delight, rushing forward. As he got closer and bent to pick him up, David and I stared in delight when we saw the tell-tale sign that the imposter was being accepted - - - he placed his thumb firmly in his mouth!! His go-to Blue Bear greeting! 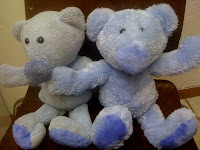 David and I high-fived in delight as our kiddo collected Blue Bear #2 in his arms and hugged him tight! ...but our elation was short lived. before dropping faux Blue Bear distainfully on the floor. "Really, guys? You expected me to fall for that? What do you two dopes take me for exactly?" Then he placed his hands on his hips and stood staring at us until I reluctantly headed for the hall closet, unearthed the hidden Blue Bear #1, and handed him to Snood in defeat. 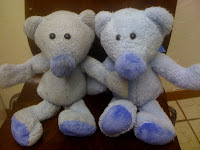 So it is that I come before you today to announce that Operation Replicate Blue Bear has proved a resounding failure. My attempts to avoid the fate of so many parents before me, who have struggled through lost and decaying loveys, were in vain. Oh, and also to let you know that if any of you are in the market for a 15-inch Blue Mr. Beeps I have one at a super-discount price (now available in regular and extra fuzzy).